Overall, the benefits of virtual simulation outweigh traditional design methods on numerous levels, enabling product design timescales to be met more efficiently, and ultimately in a way that helps companies to innovate and grow. A report published by The Aberdeen Group, explores how companies today are approaching New Product Development and Introduction (NPDI), and how companies using virtual simulation are outperforming their manual calculation peers. A Canadian-based simulation software developer, Envenio, summarises the report in this article which discusses the drawbacks of the various methods, and barriers to using virtual simulation. For organizations to remain competitive and efficient, new products must go to market quickly. While efficiency is key, it is vital that designers also make accurate, solid decisions that maintain and improve product quality. For companies to successfully innovate, they inevitably have to create more complex designs, and as such must understand product behaviour more implicitly. In this study, 42% of respondents agree that products are becoming more complex. While this push for innovation often leads companies to greater success against their competition, it also leaves designers having to make trade-off decisions between speed, cost, and quality. 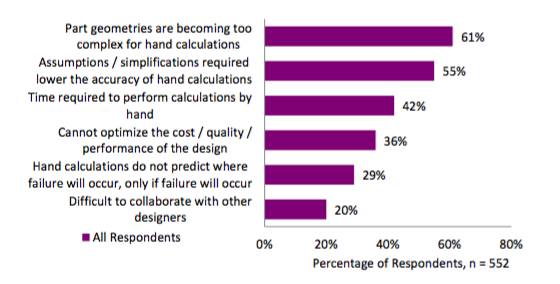 37% of respondents reported how products are now having to operate in varying and complex environments, meaning that engineers are having to assess how multiple product designs behave in various dynamic environments, while trying not to add any further time delay to development schedules. Limited resources are often blamed for development schedules being delayed, and over 60% of surveyed companies reported feeling understaffed in their technical positions. The ramifications of such delays can be catastrophic for companies, and 16% of those companies surveyed, reported a decrease in meeting product launch dates. The report discusses the performance of ‘best-in-class’ companies (those who meet atleast 88% of product launch deadlines), who despite a number of typical challenges, release high quality products within the timeframe intended, at a low cost. One reason why best-in-class companies manage to outperform their rivals, can be attributed to a more successful verification and validation (V&V) process. The importance of a solid verification and validation (V&V) process cannot be understated, with failures during this process often resulting in expensive recalls, delays, or increased liability. The use of virtual simulation in optimizing V&V has largely been confined to larger industries such as automotive and aerospace, but as virtual simulation becomes more accessible, small and medium sized businesses have utilized its analysis and simulation of product behaviour. 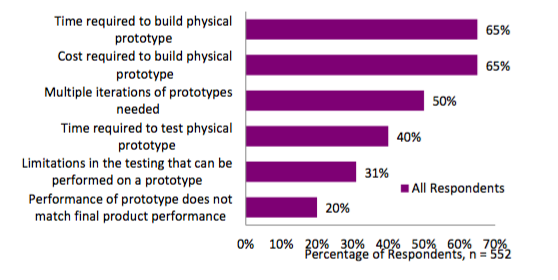 65% of respondents reported time and cost restrictions as the top two challenges of using physical prototypes, and with a number of iterations possibly required, it can be extremely wasteful. With time delays being such an important factor in product design, the number of physical tests that can be conducted (acoustics, fatigue, stress, etc) can substantially increase the time it takes to fully assess the performance and reliability of a product. Changing the product design or test environment can sometimes restart the entire process. There is very little agility and responsiveness during physical prototype testing phases, and products are often constrained to a limited condition set in order to meet deadlines. While this practice has been used for centuries, 61% of respondents report that part geometries are becoming too complex for hand calculations, and 55% report that more assumptions and simplifications are required, therefore threatening accuracy. Data shows that hand calculations are largely rough estimates, and in many modern cases, can fail to calculate the highest stresses entirely. Identifying where the failure will occur is also troublesome, and sharing these spreadsheets with fellow designers can also present problems. Again, this approach is not highly automated or scalable when it comes to many parameter sets and conditions, thus limiting a team's product design and development productivity. Best-in-class companies who regularly meet product design deadlines, are using simulation software. 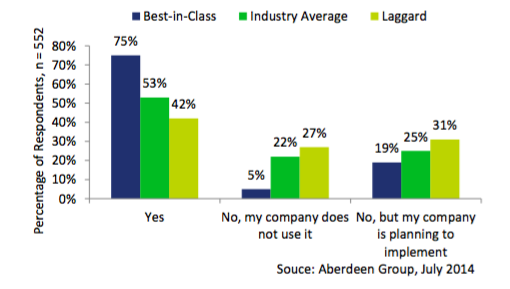 In fact, only 5% of best-in-class companies indicate that they will not implement simulation tools. Previously, only specialists in larger organizations from the aerospace and automotive industries typically used the software, but the landscape of virtual simulation has changed, becoming more affordable and accessible. Just 9 of the 299 respondents using virtual simulation said they did not believe it brought value, and the report points out that a number of factors including improper training or use, lack of best practice, or a poor company structure, were contributing to any negative conclusions. Over recent years, virtual simulation has become easier to use and more intuitive, and the software has increased its depth of capabilities including conditions like dynamic stress, fluid flow, heat transfer, and nonlinear static stress. The key advantage of virtual simulation is being able to look at the system as a whole, identifying any issues that may have otherwise gone unnoticed. What’s more, designers can quickly explore the performance of multiple design alternatives in multiple environments. In essence, virtual simulation allows manufacturers and designers to explore ways in which a product can be further optimized, while reducing the time to market. So Why Aren't More Teams Using Simulations? The research asked those respondents not using simulation software, to select their top three reasons for doing so. The cost of simulation software solutions was given as one of the most common restrictions for respondents (51%), with a lack of confidence in simulation accuracy, and confusion as to how to accurately model behaviour, completing the list (both with 46%). We wrote about the cost barrier of using simulations here. Virtual simulation companies are recognizing the concerns raised in the industry, and as such, simulation software vendors continue to develop software that is accessible at all levels, as well as training practices to ensure its proper use. Companies such as Envenio remain passionate and committed to providing easy-to-use, high performance software to each and every engineer, without the need for over inflated costs or power resources. Their solver introduces speed ups via parallelization techniques that dramatically reduce compute costs of simulations. Advances like this will help more teams in the industry adopt simulation into their NPDI processes. Product Complexity; Manual methods cannot keep up with advances in product complexity, and more accurate predictions are required. Lack of Resources; This is particularly the case among manufacturers, and more and more companies are looking at ways to make their designers more efficient. The Limitations of Hand Calculations; Product targets are more likely to be met by those using virtual simulation, and overall cost and development times are considerably less, than when compared to hand calculations. In addition to these advantages, there are also factors to take into account when looking at increasing the widespread use of virtual simulation. While accurate and reliable simulation platforms are vital, the ability to allow for use by non-experts cannot be overlooked. Non-experts can become frustrated with software, and even return to methods that they ‘know best’. This could have a ‘dampening’ factor on the benefit of virtual simulation for an organization, and therefore user training must be an important priority for those companies both producing and utilizing virtual simulation. Overall, the benefits of virtual simulation outweigh traditional design methods on numerous levels, enabling product design timescales to be met more efficiently, and ultimately in a way that helps companies to innovate and grow. The paper concludes that virtual simulation simply cannot be overlooked as a tool to maximize product development. Envenio have developed EXN/Aero, a CFD simulation tool that uses computing hardware more efficiently than other CFD products. The end result is strong speed ups (10-20x) which enables engineers to run faster simulations, larger or higher resolution simulations, and to reduce their cost of simulations. It is available for install on a local workstation or cluster, or via the cloud as an on-demand solution (where the user only pays by the hour and does not need an annual license).